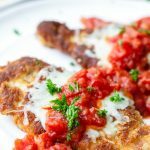 This easy chicken parmesan recipe has become one of my favorites for one simple reason: it’s absolutely delicious. 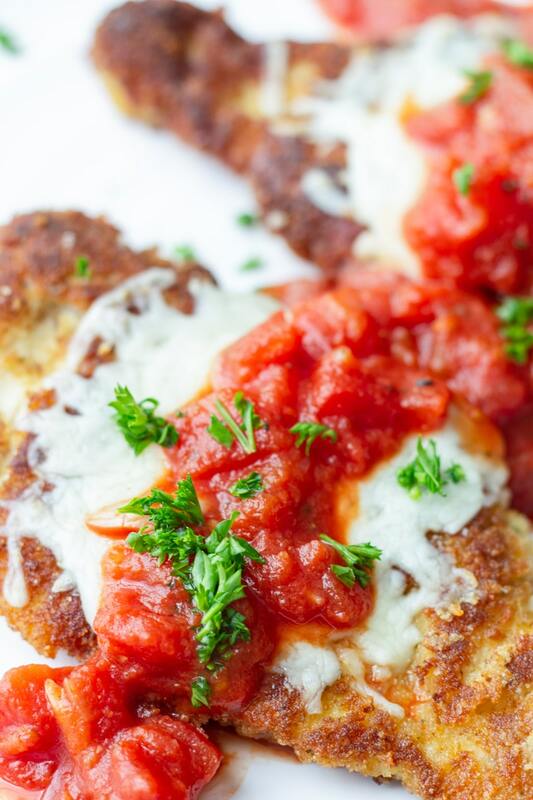 It’s the perfect chicken parmesan recipe for a quick weeknight dinner or even date night! After all, Italian food is always a winner! 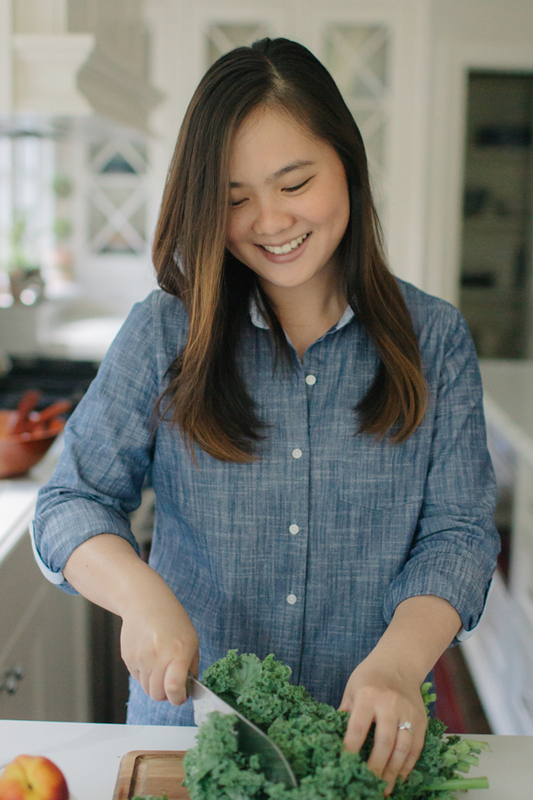 I started this blog with the intention to not only share delicious recipes, but also to explain techniques, share cooking tips, and ultimately, to inspire people to cook. 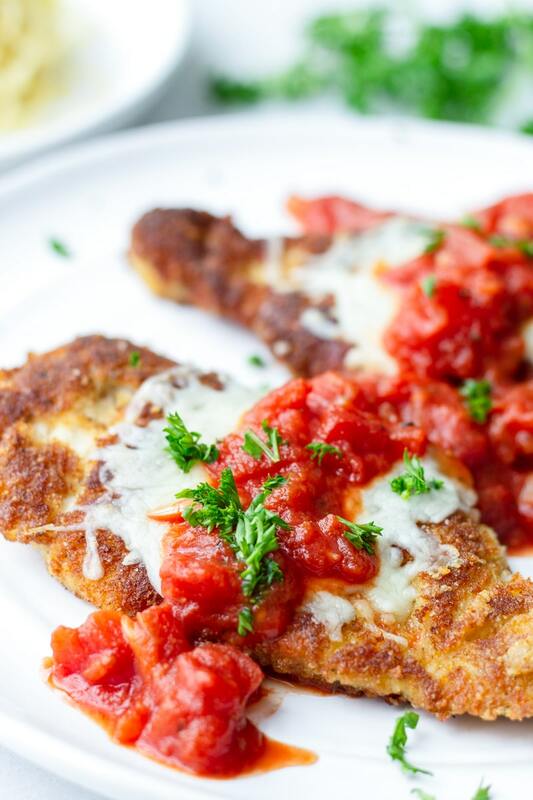 Chicken parmesan is one of the first things I learned how to cook from an online recipe, and the blogger made it really easy to follow, sharing tons of cooking wisdom. So, today, as I share this easy chicken parmesan recipe with you guys, I hope I can do the same and inspire you! So, this easy chicken parmesan recipe. Guys, THE best chicken parm recipe. The chicken is breaded and seasoned to perfection, and cooked on until golden brown. 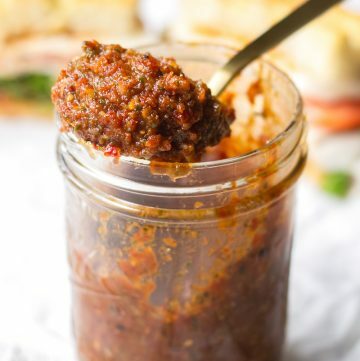 As for the sauce, you can either make it from scratch or just use your favorite store-bought sauce. I’ve made this a few times already, and I’ve got some awesome tips for the best breaded chicken parmesan for dinner. 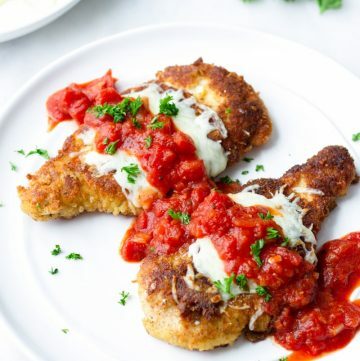 Basically, to prepare this chicken parmesan recipe, or chicken parmigiana, you’ll need to make the tomato sauce in advance (or you can get pre-made sauce), and prepare your breading station for the chicken. So let’s get started! Prepare your marinara sauce (details below). Cut thick chicken breasts in half, horizontally, to make chicken cutlets. If your chicken breast is small, leave it as is and skip to the next step. Why? Because the chicken is breaded on the outside, the breading will cook and brown much faster than the chicken, which is why you need a thin chicken breast cut. If it’s too thick, you’ll end up with either a golden brown exterior with raw chicken OR burnt breading and cooked chicken. Place plastic wrap on top the chicken and, using a meat tenderizer, pound the chicken cutlets until evenly thick, and season with salt and pepper. Why? To get them to even thickness and prevent them for curling up on the sides when cooking. The plastic wrap is to prevent bacteria from flying around. Prepare your breading station: dredge chicken cutlets in flour, then egg, and then seasoned crumbs and parmesan. On a non-stick skillet, cook each side about 5 minutes, until cooked through and golden brown. Add cheese on top (don’t pile it up too high), and broil for 1-3 minutes until melted. Watch it carefully so it doesn’t burn! Then all you have to do is serve this chicken parmesan with some marinara sauce. 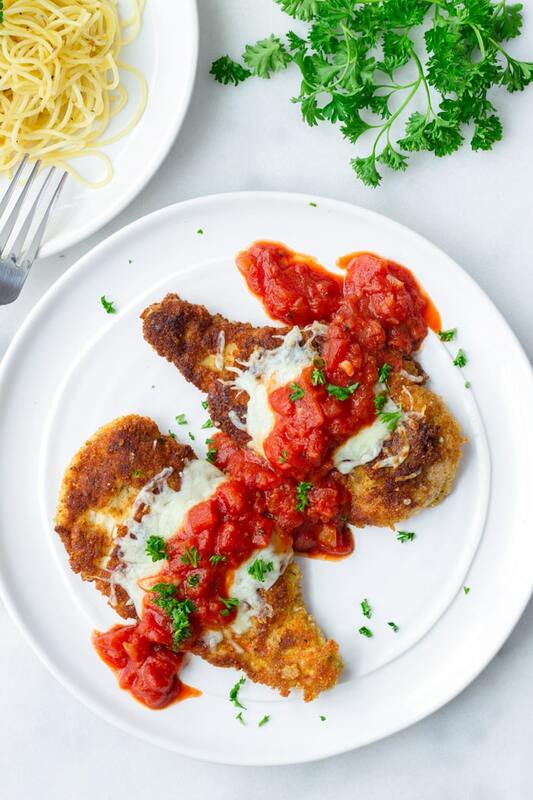 This is a quick shortcut marinara sauce for this easy chicken parmesan. I’m a big proponent of a good, patiently cooked marinara sauce, but hey…life is life, and sometimes you need to take shortcuts! Sauté diced onions and garlic in a medium saucepan with olive oil until fragrant. Add crushed tomatoes, chopped basil, and season with salt and pepper to taste. Bring to a boil, and then down to a simmer. Simmer for about 10-15 minutes while you prepare the chicken. That’s it! Ready to top your parmesan crusted chicken. You can even use it as pasta sauce if you’re serving it with pasta. Cut each 1 inch chicken breast horizontally to get 1/2-inch thick chicken cutlets. If the chicken breast is already kind of small, don’t cut it and just pound it to 1/2-inch thick. Then pound the chicken cutlets to even thickness using a meat tenderizer. It helps with even cooking, and also makes it tender. Season the chicken cutlets before breading. But don’t overdo it because the breading will be seasoned too. Dredge the chicken cutlet in flour first. Why? To give the egg something to cling onto, to sear the moisture from the chicken, and to promote browning. Then dredge in egg. Why? To give the breading something to adhere to. Then dredge in the prepared breading and parmesan. To prepare the breading, combine Italian breadcrumbs, grated parmesan cheese, garlic powder, salt, and pepper. 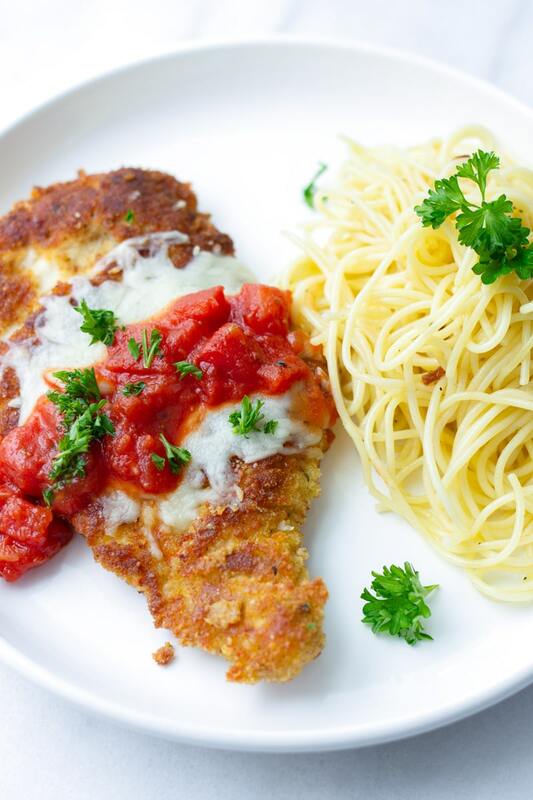 I hope you like this easy chicken parmesan dinner. I’m making it for Valentine’s day in a couple of weeks, and I am super excited! I served this chicken parmesan with some spaghetti aglio e olio. I don’t have a recipe for this yet, but my favorite is Ina Garten’s spaghetti aglio e olio. Other pairing ideas: caesar salad or any other simple salad, roasted veggies, garlic bread. 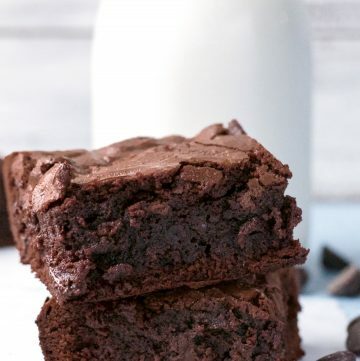 If you try my recipe, use #cookingformysoul on Instagram! 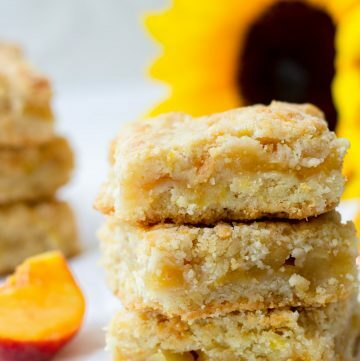 Follow me on Pinterest, Instagram, Facebook for the latest fun updates and recipes! This Easy Chicken Parmesan recipe is so easy and quick to make! It's the perfect choice for a weeknight dinner. 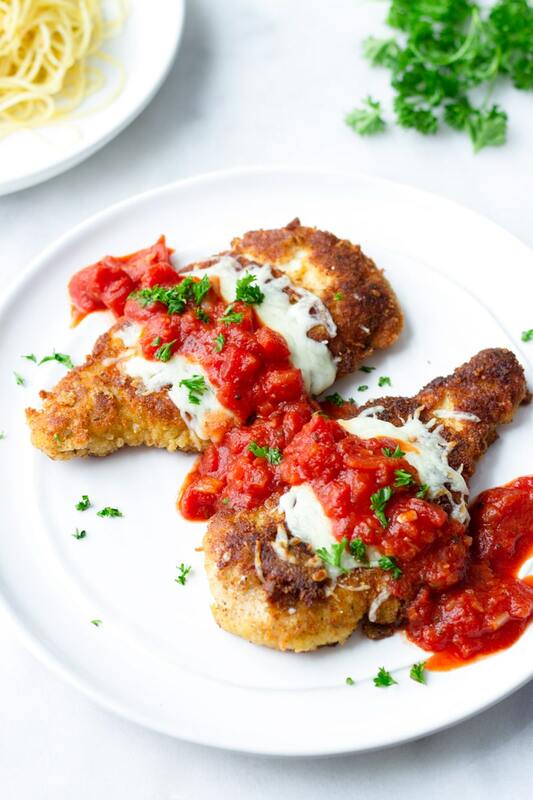 This chicken parmesan is made with a shortcut homemade marinara sauce and cooked until golden brown and crispy. 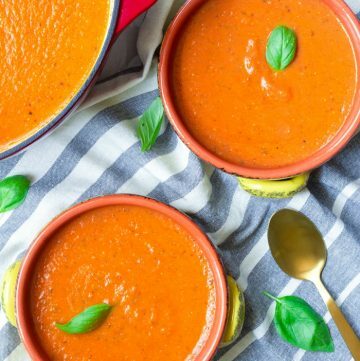 Prepare the marinara sauce: in a saucepan, heat olive oil to medium heat. Sauté the onion and garlic until fragrant, about 1 to 2 minutes. Add the rest of the marinara ingredients. Bring to a boil, and then reduce to a simmer. Simmer about 10-15 minutes. Meanwhile, prepare the chicken. Slice each chicken breast in half, horizontally, so that you have 2 cutlets (1/2 inch thick) per breast. Pound each cutlet slightly until evenly thick. Pat dry, and season both sides with some salt and pepper. Don't overdo it, the breading will be seasoned too. In shallow bowl, add the flour and season with a generous pinch of salt and black pepper. Then, in a second shallow bowl, add the whisked eggs. In a third shallow bowl, add the Italian breadcrumbs, grated parmesan, 1/2 teaspoon Kosher salt, and the garlic powder. Heat some oil in a large non-stick skillet. One by one, dredge chicken on flour, then egg, then bread crumbs (in this order), shaking any excess ingredients as you go. Repeat with remaining chicken breasts. Test that the oil is hot enough by throwing in some breadcrumbs. If you hear a sizzle, then it's ready. If you add the chicken to the pan before the oil is hot enough, you'll end up with a soggy crust. On an oven-proof non-stick skillet, heat some oil to medium heat. Cook chicken, about 5 minutes each side, until golden brown and cooked through. Quick tip: before one side is golden brown, I flip it and cook the other side, and flip it back again and so on. This promotes even cooking, while preventing one side from browning too quickly. Turn off heat when chicken is ready. Add a handful of shredded mozzarella cheese on top of each chicken cutlet, without piling it high (for even melting). Broil in the oven for 1 to 3 minutes, until melted. Important: If your skillet is not oven-proof, transfer to a sheet pan and broil. Watch it carefully, don’t let it burn. Top with a few spoonfuls of marinara sauce and parsley. 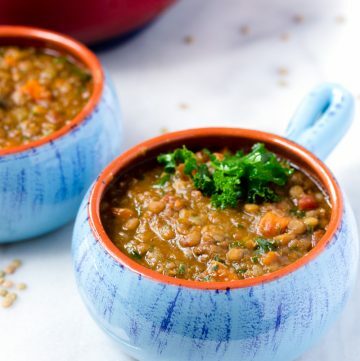 Serve with spaghetti or any other sides you like!